Emotional Alchemy maps the mind and shows how, according to recent advances in cognitive therapy, most of what troubles us falls into basic emotional patterns, including fear of abandonment, social exclusion (the feeling we don’t belong), and vulnerability (the feeling that some catastrophe will occur). Through the simple practice of mindfulness taught in this book, we can free ourselves of such patterns and replace them with empathy for ourselves and others, as well as the freedom to be more creative and alive. TARA BENNETT-GOLEMAN, M.A., is a teacher, author, and psychotherapist. 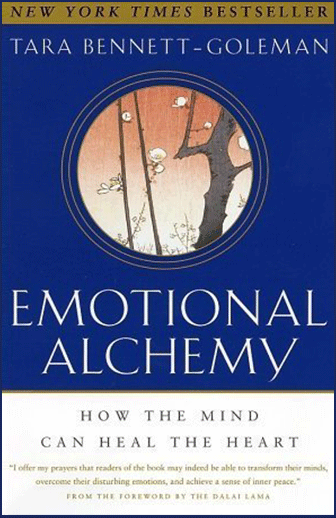 Tara’s book Emotional Alchemy: How the Mind Can Heal the Heart (Harmony Books, 2001) was a New York Times best-seller and has been translated into 25 languages. Her new book Mind Whispering, on sale April 23, navigates a new path to freedom from self-defeating emotional habits. This ground-breaking map of the emotional mind helps us transform our emotions, improve our relationships, and connect us to our inner wisdom.